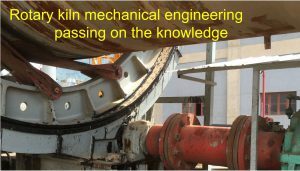 Whitehopleman’s 5 day on-site training course on rotary kiln mechanical engineering is designed to pass on the knowledge of all aspects of the design, adjustment and maintenance of rotary kilns. The importance of the kiln axis and axial balance. The problems that can arise with a kiln crank or excess shell ovality. The kiln shell, tyre fixings, support rollers, girth gear and drive, seals, lubrication. The rotary kiln is the heart of an integrated cement factory. Mechanical problems with the kiln can lead to massive loss of clinker production, sales and revenues. Continuous monitoring, adjustment and maintenance are vital to the integrity of the kiln and factory. Whitehopleman’s course covers all these topics in theory and by on-site inspections and practical adjustments on your kilns by your mechanical engineers under the guidance of Whitehopleman’s kiln mechanical engineering specialists.